Since its original publication in 1971, A Community Mass has become a staple for many parishes. 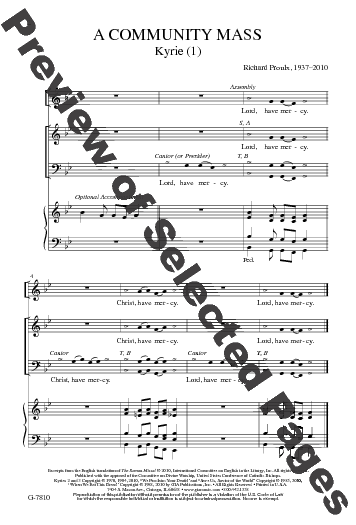 Due to its wide use and inclusion in various denominational hymnals, additional material and new instrumentations were periodically created by the composer. These “enrichments” have made A Community Mass adaptable to a variety of circumstances and forces-from cantor, assembly, and organ to performances by choir and assembly with small or large instrumental ensembles in addition to organ. Thus an “ordinary” setting is transformed into a “festive” setting in the appropriate liturgical context. The current edition contains Proulx's own alterations for incorporating the 2010 Revised Order of Mass.